So, what’s happened this year? Not much new, and the news is mostly good. First up, I did have a run-for-the-toilet event during the second week of class. That was an actual viral infection that put me in the small room for 18hrs, and dropped five lbs. Worst illness I’ve had this Century. Probably a suppressed immune system effect from the chemo, but not a chemo response, which is good. As usual, Mr. Phelps, I’m not cured. I’m not done with chemo. This will go on for maybe another four months. I took notes at our last meeting, but I’m as bad as the students at getting the key points. There’s two proteins we are tracking. One started out at 3400 (mg/L? part of the problem is that different sources use different units of measure. ) and is now down to 340, which is in the normal range, while the other started at 2.5 and is now down to 0.3, but we want that to be zero. Still, the oncodoc is very encouraged. As for side effects, fatigue and sleep disruption continue, and I still have no stamina. Walking home from school wears me out. When I’m not at work, I’m napping. Fluid retention remains an issue, but not as bad as earlier. Some blood pressure fluctuations. I get cold, and my systolic drops into the 90’s. Or maybe it drops and I get cold. Then it spends most of the day back up in the 120’s. We are fiddling with my heart meds, and I probably need to stay better hydrated. MJ says that during the Revlimid weeks, my voice gets rough. Speaking of, we had me down to 10mg of Revlimid/day to suppress a rash. This cycle, we’re back up to 25mg. 48hrs in, and no rash. EWU has been very understanding and supportive about letting me skip meetings (except that I will be attending Faculty Senate twice a month), and the students haven’t started complaining about slow grading yet. I guess since everyone is weighing in on the Hawaii fiasco, I guess I should also, since I was peripherally involved with that sort of thing. Civilian attack warning started out as CONELRAD (those funny triangles on your old radio dial). That was replaced by EBS, which was replaced by EAS, the Emergency Alert System. Under this, the states get messages from the federal government (FEMA), which gets the original message from the military, and take whatever action they deem necessary. Unlike CONELRAD, EAS is designed for multiple threats, including natural disasters, like tornadoes and wildfires, and so gets inputs from NWS and other federal agencies. For a nuclear attack, there’s often a canned message. If there’s a canned message, there’s always the chance it will get released in error. In the case of the Hawaii alert, the system was apparently being tested during a shift change, and the wrong selection was made off a menu. Then it was confirmed. Easily done. Could happen to anybody. In fact, it should have been expected, since the system was just reactivated following a post-Cold War stint in mothballs. This is not the only time such errors have been made. On at least one occasion, many years ago, a CONELRAD test sent out a message that caused a number of US radio stations to shift to the emergency frequency. More often, errors at the state level have caused local disruptions. The US military has people trained and dedicated to this sort of thing 24/7. The states have, essentially, whoever is on duty in their public safety center, watching for wildfires and riots. And therein lies the problem. As with the See Something, Say Something approach to countering terrorist activity, if you depend on amateurs for warning, you get amateur warning. If it had been a real missile attack, how many of those people we saw running around would have been saved by the warning? Would being over there, instead of over here have protected them? Aren’t you glad we had a warning? Will you quit it with that book already? You know, the one everybody’s talking about; the one everybody’s bought; the one nobody’s read? Does it tell us anything we don’t already know? No, not really. Is the information it does contain, reliable? No, not really. Does it add anything to the national discussion? No, not really. Does it provide anything resembling actionable content? No, not at all. Every discussion about that book just lowers the information content of the room, and I mean that in a formal, signals processing context. All it does is distract from the real policy issues that should be informing our actions. UPDATE: Somebody else said it better. What should we be talking about, and acting on? Stacking the courts with incompetent, right wing, young, judges. The GOP has polluted the US justice system for the next 30 years. Destroying the structure of protections provided by FCC, FDA, EPA, and all the other agencies that Trump has named anti-agency heads to. Destroying the health care system for those who need it most. Destroying the web of relationships in the Middle East, handing the dominant role there to Iran, while making sure the Iranians continue to view us as their hated adversary. Abdicating our role in the Pacific, handing the dominant role to China. In 2020, if not sooner, Trump will be gone, but the ruin he, and the GOP, leave behind will still be there, and will still need rebuilding, so that we can, you know, Make America Great Again, and you don’t need a book to tell you that. I’m one of those who watched Fate/Stay Night ten years ago, the first and worst of the Fate/ franchise. That inoculated me against all the follow-on products, until last year, when phrases like “critical acclaim” induced me to reconsider. 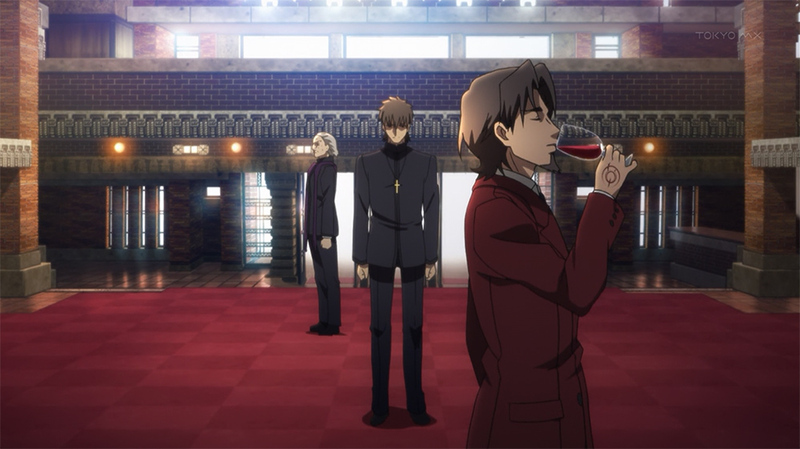 Episode 1 of Fate/Zero is an hour-long expository lump. I tried watching it, and got 14 minutes in before my gag reflex took over and I ran for the remote and a soothing dose of Chaos;Child, or maybe it was Code:Realize, or some other show with a special character insert. Nothing daunted, I tried again in the New Year. This time I got 19 minutes in, and broke out in a rash. Fate/ and I are …. fated…. to be forever strangers. It would be too boring to just stand in this big room and talk, so we’re going to walk around you in a big circle and talk. Synchronized swimming comes later.